I'm sadly one of those nostalgic bakers. I don't care for all that fancy, artisanal equipment such as fancy knives, tins, etc. But what I do yearn for is a little wooden trough, like the good olden days. You know, since I always use my trusted wooden spoon and pyrex bowl to get things going, and finish the job on a boring glass chopping board. I dream of getting myself dirty and arm deep in a litte trough in the garden Pathetic, I know. Naturally, troughs were used to mix and knead several KGs of flour. Since my daily batch is rarely more than 500g, I woudl not need a biggie. Were would one purvey one? Garden centre? (I've tried, they're all fancy, or plastic). Also, does one have to treat the wood before use? I suspect keeping it would be as simple as rinsing it with water and letting it dry naturally. I'd recommend you to build one yourself. It might not turn out a beauty, but that's just going to add to the rustic feel. Use untreated, unvarnished wood and don't put any finish on it. Make four sides and a bottom and just screw them together from the outside. And don't keep it outdoors. LOL, I would love to! Also, I'm in the UK so....Maybe ebay. Yes, it's steep asking price. And kind of what I'm after, but not at that price. It's just lust this trough business. I may give in and buy a squarish/rectangular one at the garden centre if it ever goes on sale. They're just too romantic. All that traditional baking lark. Do you mean storage should be indoors, in a clean place....? Yes, I meant storage. 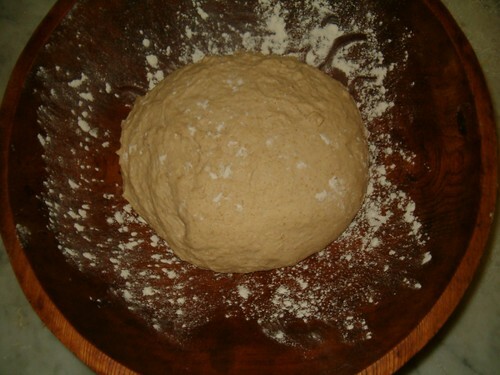 You could probably get away with covering it and letting the dough rise overnight, provided there's no rain. It's just that untreated wood will decompose pretty quick if kept outside, but a night outside once in a while won't do it any harm. These run for about 300 LTL (about £75 or €87 or $114). It's not cheap though, but it also isn't something you can really make yourself. The one in the picture is a 20 liter. Historically, they were used for mixing 100 % ryes, but I can't see why wheat wouldn't work. Syd-a, just what I'm looking for. It's only 40cm, the perfect size (for my small doughs) and only £19, that's more to my budget. With untreated wood, do you need to be concerned about splinters? I expect if it starts to deteriorate (roughen, I mean), it'll just need a sanding? I do know, like bannetons, they need proper airing in a dry room, in case damp will encourage, moulding? Somehting quite difficult in winter time I expect. Mister TT, love that tub. I would just get one of those, except it's a bit deep and less roomy for kneading purposes. Here in the UK, they're about the same price (but these style of tubs would be sold as garden planters.) We simply do not have your baking tradition. I wouldn't worry too much abut splinters, the finish looks pretty good and with regular use it will develop a natural finish from the flour and dough. Depending in its durability I wouldn't even wash it, just give it a good clean out between doughs. I also wouldn't expect much mold to develop and as long as the wood isn't left in a constant steamy environment it will be fine. Thanks again for having a look for me, I was definitely looking in the wrong place. Those garden planters/troughs are far too big and not really suited for breadmaking. This is where I got my dough bowl. A true jem and worth every dollar. Have you checked the TFL archives? I just checked www.ebay.com and there's a ton of them there. all sizes .. some old, some new. none very expensive. but that's here in the USA ..
Don't know where in the UK you are located but look about for some local wood carvers. (We lived in Swansea, Wales in the early 80's and there I would have looked for spoon carvers.) A dough bowl is an fast and easy item for a carver to make and should not cost you a whole lot. (Still it is hand made). Check out some of the summer craft shows and talk to the woodworkers -- you might just find someone just down the road. Sorry, i missed this yesterday. I'm in London and have never thought about a carver's. Are these woodsmiths? Mini Oven, ack, sorry. I've been caught by the TFL police! Thanks for all the links, and yes, I expect most niche things like this selling on Ebay will be pricey. Also, I've imposed a self-ban from ebayUK since they're idiots, so can't bring myself to buy anything from there. The problem with those sold as 'fruit/salad' bowls is that they're not sturdy enough. It's not like I require one with legs (though a raised one would be helpful, I don't think we'd want to put a flat trough on the ground for all those nosy nightime creatures), but as we know gluten is resilient and strong: when I knead, I can often lift the chopping board. A wooden bowl would not be heavy enough, and now I say that, I'm re-evaluating that great link kindly posted above by Syd-a. 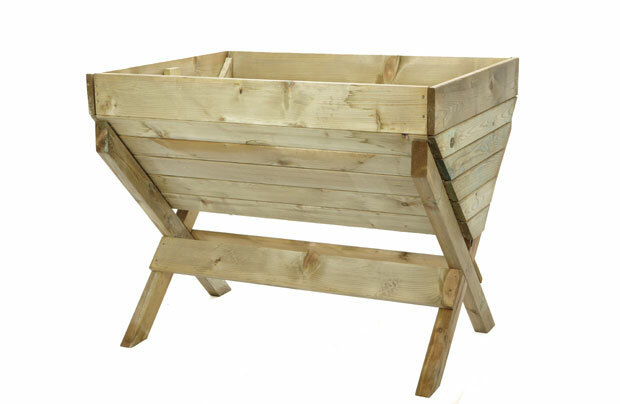 Maybe the investment for a proper garden planter would not be a bad thing, it could be used for plants afterwards, after all. Actually, I'd just like a massive, untreated wooden kitchen table onto which I can set free my dough and exercise it properly. I've persisted so long with an average glass, chopping board (the wooden ones had to go) the only surface available to me, that I'm going a bit barmy. It makes those wet doughs that need room impossible to work. Still, a trough, though fanciful, would be neat. 3 bread bowls. All are wide and low. You can S&F in the bowl non problem. All handle 1,000 g of dough well. One is an heirloom stoneware ceramic on the left that is from the 1880's. The one in back is s press wood kind of thing I got a Goodwill for a buck. But by far my my favorite is the Pampered Chef ceramic oven safe bowl on the right that I also got at Goodwill for a buck too. If Warren Buffet only knew his high retail priced stuff was so cheap! I would check out the thrift stores for a real bargain yet high quality. When i did my apprenticeship the old wooden trough was still there it had a wooden top which was pine and used for all the hand moulded bread that the bakers used to make at the begining of the shift before they were called to other areas such as loading ovens etc. It was a fun place to be first thing in the early morning with lots of banter and eyes on the new lad to see if he was learning the hand skills that were being displayed by all the men. Being a multicultural society it was also good to see different ethnic bakers styles to achieve the same result. The trough was really quite big and Grumpy told me how 3 or 4 bakers would mix and throw the dough around from one to another in the mixing process. it would have been back breaking work. This is gradually going off-topic, lol. I originally wanted a wooden trough - big, sturdy beast of a thing to keep outdoors, but now seem to have settled on a glorified wooden salad to mix and rise my dough in. A world apart! It's interesting to see how different everyone's method is. Even if I did get my trough, something would be rather foolish/hilarious about preparing all my ingredients in the kitchen (i.e. precise weighing) than just going by "baker's feel"/judgement of hand and dumping my flour in, in situ. Adds another step to my baking that I'd rather skip. One suspects a trough is just for summer months/warmer climates. Seeing how chilly autumn and winter can get in these parts, this is just the effects of all this sunshine we're having. I'd do it no, but would I, come Christmas? And thanks, Yozza, how interesting. Where are you from? I cannot imagine bakers doing their apprenticeship these days in such a traditional way! Hi Cob If you click on to ones avatar and the person has filled out their details you will be able to see where they are from which i find particularly helpfull., especially if you are offering any advice on TFL it is good to know their whereabouts. I am in Western Australia by the way. the tv program was an Australian show based in Tasmania (fat pig farm) if you google, i am still trying to find the episode where they built a wooden trough for you. Hey, don't kill yourself finding it! It's be interesting to see, but I'm as dextrous as a robot. I think trough-building is beyond my repertoire. Here are dough 'troughs' I use for 1 and 2 loaves of bread. The small one is made by Tupperware and made for food and handles 1,000 g of dough and lthe larger one is a plastic shoe box. Both in the shape of dough trough but plastic. I use both just like a dough trough too. Talk about off topic.... but no bending over and killing your back over 500 g of dough either :-) Yep got both at Goodill for a total $1.50. Worst case you can use them for a mould to make your own wooden trough! 0oo! troughs that can fit into the fridge! thy stack nicely so they don't crowd out the beer ! Take off the feet, and thickness of the wood/finish, I'm looking at some sort of wooden salad/server bowl, small enough for a small batch of dough. See how we've gone off-topic all too quickly! 'Back-breaking' is being mentioned a lot. I think, that's a sign from the bread gods, don't bother....I'm only a humble, wee homebaker. I think one has to make do with plastic tupperware. looks better in a manger. My armpits and elbows hurt just thinking about hanging over the edge! I imagine an efficient bread trough to be more flat and table like but with an edge. When not in use, it is flipped over and used as a table with the edge side down resting on the support. Maybe that will inspire some ideas. Bread blogger mc-farine has a wonderful blog entry (one of several) on master baker Gérard Rubaud. He runs a one-man artisan bakery in Vermont and he uses wooden troughs for all his dough. He designed the bakery himself. He set it up on the model of an 18th century French bakery, working from old engravings to have a local carpenter and a woodworking buff he knew from his restaurant days reproduce the equipment commonly found at the time... By opting for old-fashioned equipment, he wasn't trying to be quaint or to make a statement. He just chose what he deemed best for bread and in his opinion, wood is best because it allows the dough to breathe without perspiring. Check out the photos showing the troughs he uses and especially check out the video showing him tipping out the risen dough onto the bench. Mountain bread tray, bowl or what ever. I been off doing other things and didn't get back to the comments here. Here in western North Carolina a simple carved wooden tray was use for both bread and biscuts. It was just made from a heavy plank of wood about 12 inches wide and about 20 inches long, Maybe 3 inches thick - but sizes varied a lot. The wood was carved (hollowed) out and the over all thickness of the wood would be about 1/2 to 5/8 inch thick, with a flat bottom. It was important that it be thinned down to the half inch or so or the wood would split as it dried. Most common would was poplar but soft maple would have been used too. Oak would not be a first choice because of the tanins. Center of the tree is to the top so the natural cupping as it drys is up. No finish on the wood, would last for years. Could not help but eye up his spacious work surface. I need to find myself a wooden plank. End of story. It never mentioned if he covered his dough for the rise. It seems like he just dusted it. I'd have thought he'd wanted to have preserved moisture in the dough and covered it. I actually think some perspiration aids the rising. It's nice to think we all have a preference for wood. deblacksmith, will check out some woodsy-type smithy's, if I ever come across them on my travels. Cannot even find a brewers, even though I'm a stone's throw away from Kent. hi cob i have still to track down the correct episode where a trough was made for dough making by hand but it was a show called the gourmet farmer or google fat pig farm but in the mean time have a look at this trough in a local old bakery museum http://www.melvillehistorysociety.org.au/bakehistory.html you will see why i said it was back breaking work. Their trough has given me a brainwave. A wooden chest. Like those childrens' ones. And they come with a wooden top. Hmmm, it does seem perfectly salient that troughs are not great for the old back.